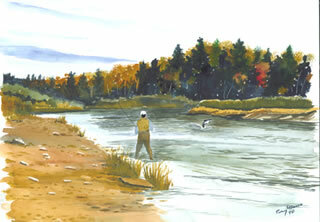 A lifelong interest in the outdoors expresses itself in many ways and art is one of these evolutions. 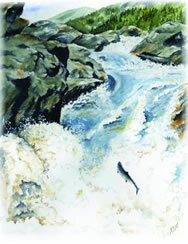 Both Judi and Perry express their love of local flora and fauna in their watercolour paintings. 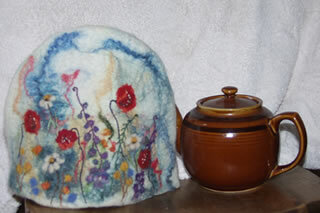 Judi’s paintings reflect her love of gardening and rural scenery. 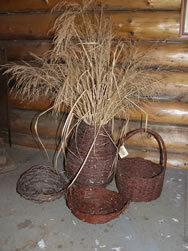 She also creates baskets (as has been done for centuries) from whiths collected in the woods. 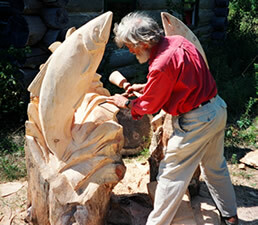 Perry’s art reflects his love of angling and the landscapes he has encountered on fishing trips through-out North America, he also sculpts in wood, creating both furniture and standing wood carvings.. 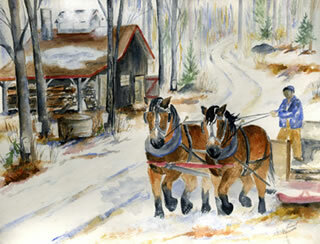 The art is available in a small gallery next to the lodge in a stand of sugar maples. Originals and prints and cards of the different images can be purchased there, by chance or appointment, or if you wish you can contact Munro’s Mountain Maple and delivery will be arranged.